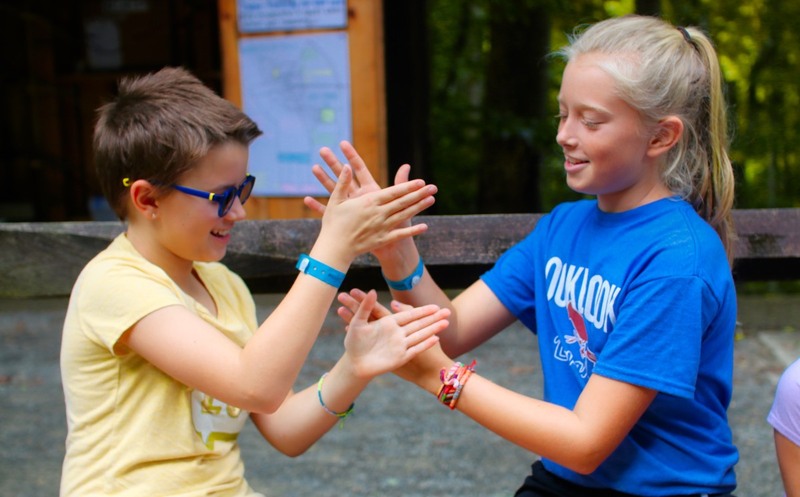 At Rockbrook, we play all the time. 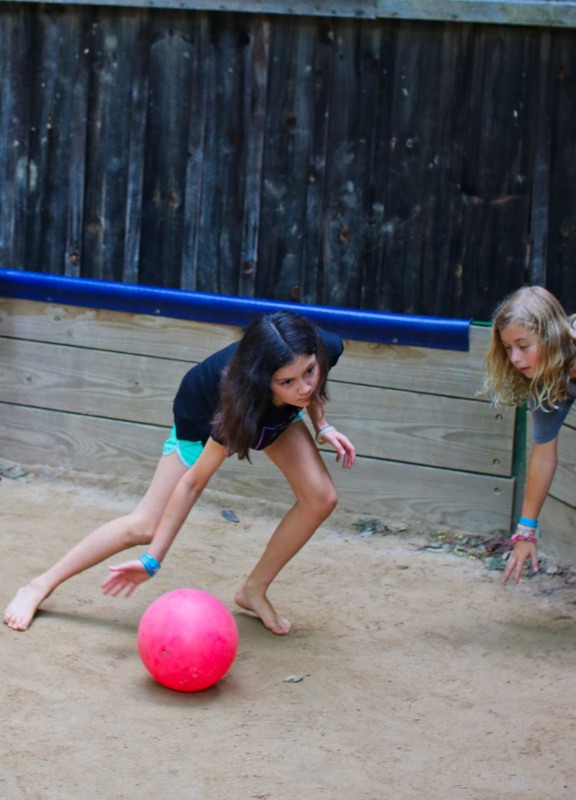 Walk around camp at almost any time of day, and you’ll see the intensity of a gaga game, a line of girls waiting to play tetherball, and hear the familiar bounce of tennis balls being hit during free swims. Even though all of these are competitive games, Rockbrook considers itself to be a noncompetitive camp. By that, we mean that we emphasize playing over winning. Though of course winning has a certain thrill, there is beauty in living in a culture that reminds us that the point of playing isn’t always to get ahead. Sometimes, it’s about finding the joy in what you’re doing, to focus more on the process of the game, rather than just the outcome. In this, competitions continue to be a way of building each other up, whether we are the next Serena Williams, or a complete novice. We learn to support each other, to win and to lose gracefully, and most importantly, to have less inhibition about just playing the game. 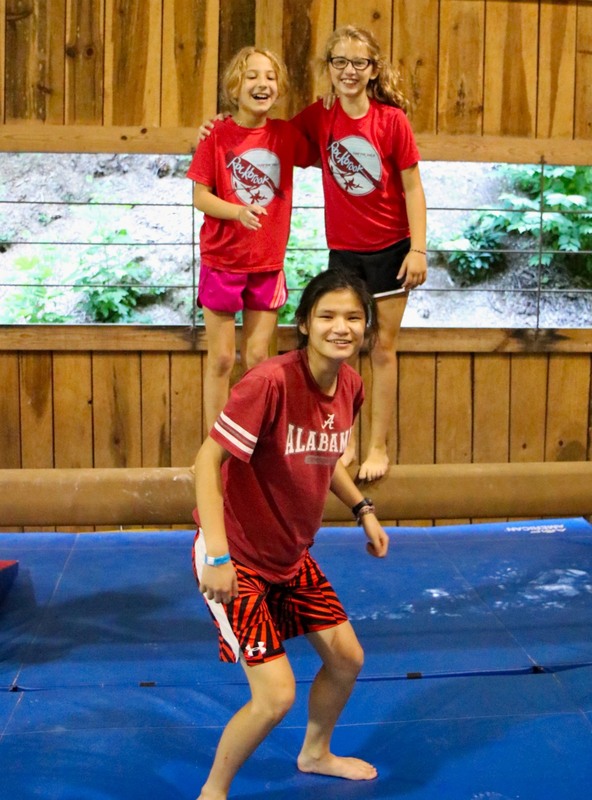 The girls left camp in matching shirts that the counselors had made for them, bringing Rockbrook spirit to Camp Carolina. This spirit pervaded everything they did. For example, I watched a match played by senior girls against Camp Carolina boys. One of the girls clearly had a ton of tennis experience whereas the other one was newer to the sport. I heard her laugh as her partner helped direct her around the court as she was serving, “Oh,” she said with a smile, “It’s not that different from volleyball!” The two constantly communicated back and forth, and she was able to hit most of her serves in. When they missed a ball, they kindly said, “that’s okay!” to each other, and when they succeeded, they clapped their racquets together in a high-five. Though the match was close, the duo ended up winning. 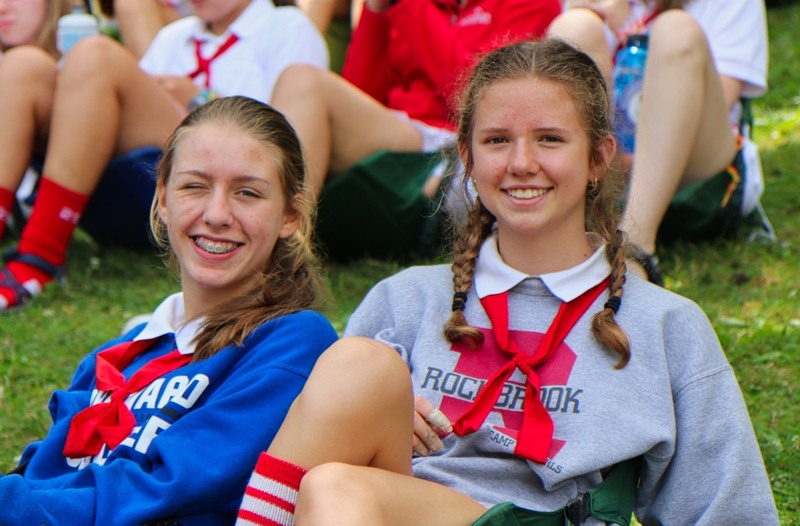 Ultimately, though, the match felt uniquely ‘Rockbrook’ to me—the girls had so much fun throughout, and the majority of the focus was on building each other up, rather than being the tennis champion of the day. Later that day, I saw a boy struggling to get his serves in the box. That same girl who did not have much tennis experience reassured him from across the court: “Don’t worry about it!” she said calmly. “I hit them out all the time, too!” Not only was she a supportive teammate to her partner, she was also kind and reassuring to her competition. In some ways, I think this epitomizes Rockbrook’s spirit. It’s not that we don’t care about winning, but we want everyone to feel that taking risks and making mistakes is okay; there should be joy in the process. 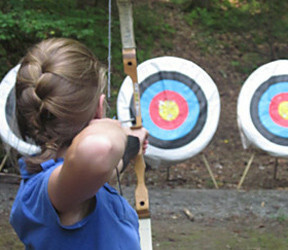 In archery and riflery, Rockbrook girls loudly cheered on their teammates, no matter how many times they hit the target. At Rockbrook, being on a team means supporting each other no matter what. This same spirit continued later in twilight when girls went to land sports to play World Cup Soccer. As a camp, we have streamed the quarter finals and finals of The World Cup, and we certainly have some avid soccer fans at RBC. Girls got into teams of three, and adopted a country that was in the World Cup! All of the teams try to score a goal, and when you kick, you say your country’s name! If you’re the last country to score, your team is out. At Rockbrook, though, when teams get out, they go to the side and wholeheartedly cheer on their friends! In a funny coincidence, France won the World Cup at RBC this year, too! What a lucky country! Today was a fun day of playing and competing. Soon, we’ll go home to our own athletic teams, schools, and other activities that ask us to compete against each other a lot. 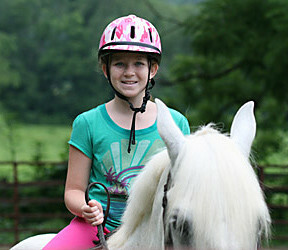 As we come from Rockbrook’s noncompetitive environment, I hope that we can all remember the lessons we’ve learned here. While winning is great, it is also important to remember to try things even when we aren’t the best, it’s still important to build each other up, even when they’re competing against us, and at least some of the joy should come from simply playing the game. We live in a country, that loves to celebrate the individual. Its fun to idealize the greatness of the one. The wonder of their singular feats to seduces us. It’s exciting to see a human be remarkable. Serena Williams and her consistent prowess as a tennis giant is already amazing, and seeing her coming back to make it to the Wimbledon finals after a 13 month maternity leave…that is worthy of our attention. Simone Biles developing a gymnastics skill that no one had ever competed before and few fellow Olympic gymnasts can even do. Of course she won a gold metal for that. Of course that’s incredible. In pop culture, we pay attention to the newest star, and the biggest star, we listen to the news on Justin Bieber or Beyoncé because they have talent, and fame and fortune enough to make them seriously stand above the crowd. There is something authentically compelling about these individuals and their successes that earns them the attention. But the trouble is, it is easy to forget that not a single one of those winners, stars, or firsts got their on their own. And its easy to overlook that the amount of attention we love to give them is actually really hard for them to tolerate. Humans didn’t evolve to be the soaring eagle, rising and flying alone in the glaring sun of that much attention. It takes even more strength in some ways to live a healthy full life when you are watched that closely. But we ignore that. We love the symbolism of the bald eagle all alone. But in our poetic use of that image as our ideal, we really fail to tell the whole story. We are pack animals. And like Wendy shared with us last week, we need touch, and hugs. We can not survive without them. And when we paint the picture as if we can, we not only set ourselves up for intense disappointment, we also fail to acknowledge that for every individual phenomenal success we adore, there is a whole network of phenomenal successes making up the community that played a part in growing these stars into the stunning athletes, or artists, or astronauts they become. In our hunger to put the Neil Armstrong’s on a pedestal for being the first human to walk on the moon, we often fail to honor the teams of exceptionally brilliant, hardworking men…and women, who’s stunning demonstration of collaboration and idea sharing, knowledge and innovation, mentorship and support, care-giving and service it took to make that kind of impossible dream a reality. And so in our own lives and dreams, it is easy to feel like we must strive to be the One in order to be valued. And while that is wonderful to aspire to, it is good to remember to recognize even those idealized heroes are members of a community. The most astonishing of whom take their place in the spot-light to look back on their communities and give back, to lift up others, to serve one another, to collaborate and create more than any one alone could ever devise, to listen and empathize, to laugh, and to hug. My heroes are those who have the will to give, and the grace to receive love from a community that they both support and are supported by. 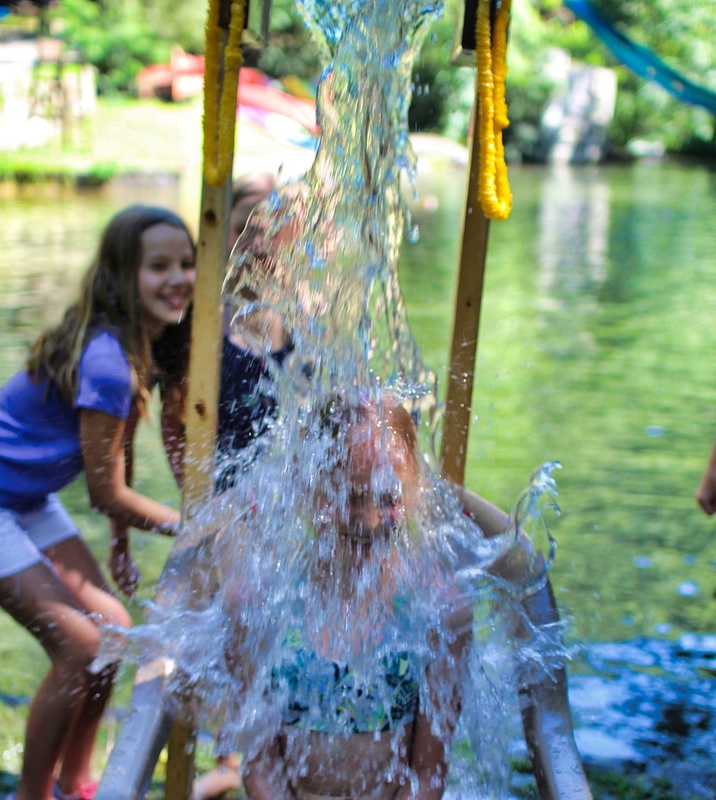 That is what is so refreshing about being here at Rockbrook. Lets take a moment to stop and recognize that we all are so privileged to share a brief time together in this magical place on the planet where being a part of the community is so easy. Where being a good community member is encouraged and celebrated. Where it is an honor to be given a task to give back to the group, or tasked with sometimes even really hard work. For example, the CA’s, High-Up, CIT, and counselors. I remember being a young camper how much we wanted nothing more than to get to be all of these respected roles. When what do they do? They work exceptionally hard to take care of their community. These are our Rockbrook heroes. So when I say it is so easy to be part of a community here it doesn’t mean it is always easy here. Do not let me take away the sense of real struggle we all can feel at times when we are trying to be our best here. But do remember that the habits of community spirit we practice here at Rockbrook are so much easier to build where we all live, eat, and play together, where we struggle up the mountainside together, and stifle our cries of fear together at the sight of a skunk, or tolerate cold showers after a long line, and laugh, and laugh, and laugh together. Here we are interconnected on everything. So being a part of a community is a natural state. It’s the latest highlights video from Robbie Francis of Go Swan Filmworks. Earlier this week, Robbie spent a day filming at camp, and with more of his careful editing, has again produced a fascinating glimpse into camp life. 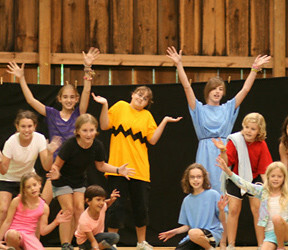 You’ve seen the photos in our daily online gallery; now see (and hear) camp in motion. At less than 2 minutes, I think you’ll really enjoy watching. Click here for the video. Or see below. So, you’d rather be a Mermaid, right? Well good news! 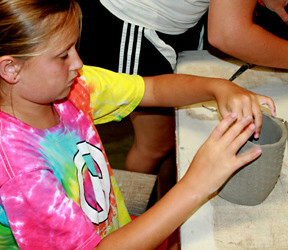 Rockbrook Camp allows you to do just that. 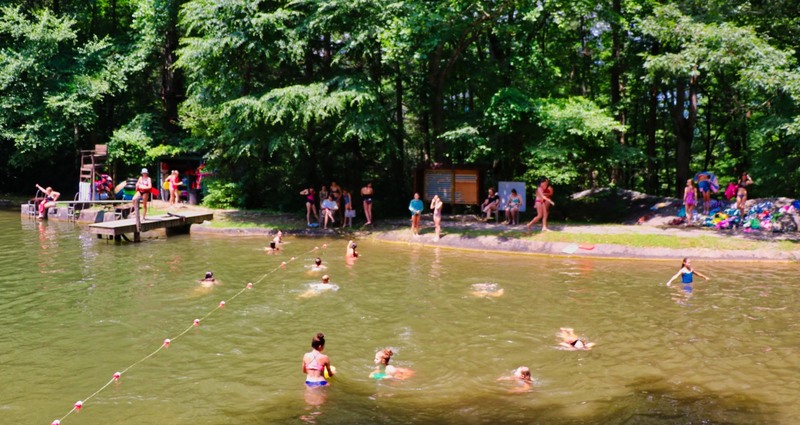 From the first day you arrive at camp, you have the opportunity to dive right into the Redbird-shaped Lake, and demonstrate your swimming style. But if you want to be a Mermaid, clearly one dip in the lake is not enough. It takes time in the water. 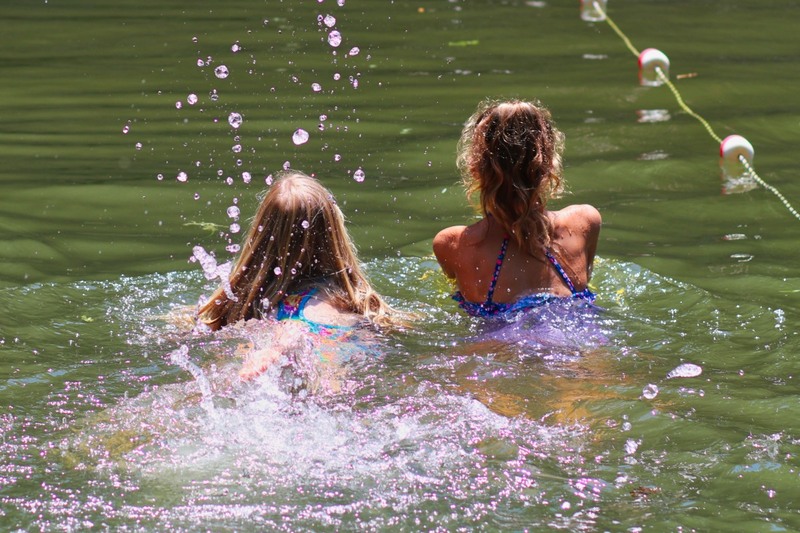 Here’s the Rockbrook guide to turning into a Mermaid! Step One: Sign up for swimming as much as you can! 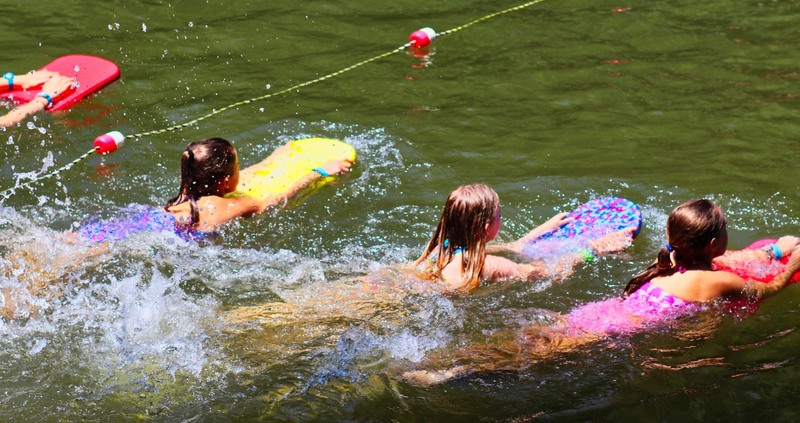 In swimming, we like to give time to the campers to swim their Mermaid laps. You will swim back and forth a lot, while the awesome lifeguards cheer you on with each passing lap. Step Two: Set a goal to swim a certain number of laps each day. Depending on your age, becoming a mermaid requires different lap totals. Juniors in full sessions swim 125 laps, while juniors in mini sessions swim 65 laps. These numbers increase as you get older! Step Three: If you didn’t make that goal amount in swimming, continue them during first and second free swim times. Sometimes, it’s difficult to meet the lap goal that you set for swimming activities. But that’s okay! It’s fine to take a break and enjoy playing with your friends. If that happens, just know that you can always swim during the first and second free swim periods to complete your laps. Step Four: Just keep swimming! Like Dory says in Finding Nemo, “just keep swimming, just keep swimming, just keep swimming swimming swimming!” The laps might seem too long, but setting a goal and being determined to finish that goal is very rewarding in the end. Especially when Dolly’s is the reward! Step Five: See your scales start to glint in the sun. You’re almost done! Just a little more perseverance. Step Six: Feel your tail start to sprout. Step Seven: Bask in the camp celebration of your transformation. When you’ve finally reached Mermaid status, the whole camp sings a special song just for you. “Way down at Rockbrook in the chilly lake. 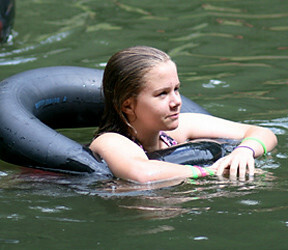 There were some girls a swimming who started to shiver and shake. We saw some scales a glinting and TAILS they did sprout. Lo and behold a Mermaid, the whole camp to shout. Oh Mermaid, Mermaid, what’s your name? Step Eight: Enjoy a refreshing scoop of ice cream from Dolly’s Dairy Bar!! You’ve earned it! You’re a Mermaid! Tetherball. 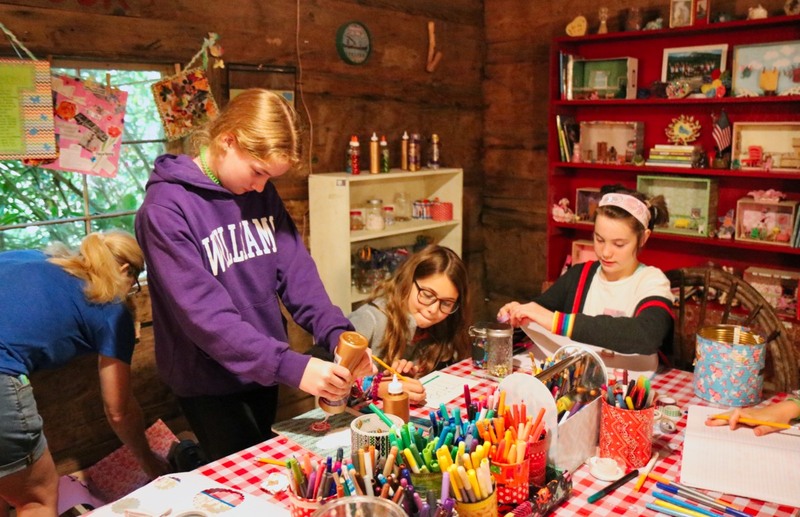 It’s one of the simplest pastimes at Rockbrook, but also one of the most popular ways for the girls to spend a few spare minutes between activity periods, right before meals, or during one the three designated slots of “free time” each day. There are two tetherball courts at Rockbrook, one by the gym and the more prominent spot near the hillside lodge. Made from a 10-foot tall locust tree pole, that tetherball court has a cool open feel to it, and since it’s centrally located, seems to always be in action. Look over the hill and you’re bound to see a colorful ball swinging around the pole on a rope. The game of tetherball is simple —hit the ball and wrap the rope around the pole as your opponent tries to hit the ball in the opposite direction… whoever wraps the ball completely is the winner. When someone wins, that’s called a “tether.” The other day a few girls explained some of the other game terminology. If a player grabs the rope instead of hitting the ball, that’s called a “ropey,” which is a foul of sorts, as is something called a “holdy,” which means grabbing the ball altogether. When one player commits either of these fouls, the other player is allowed to employ the same foul. In addition to a regular single hit, there are two more hits that more advanced players use: the “double tap,” which simply means hitting the ball once before hitting it a second time, and “popcorn,” which means tapping the ball multiple times before hitting it around toward the other player. In a tetherball match, the winner of a game keeps playing until defeated by a challenger. The challenger always serves, which is a slight advantage. 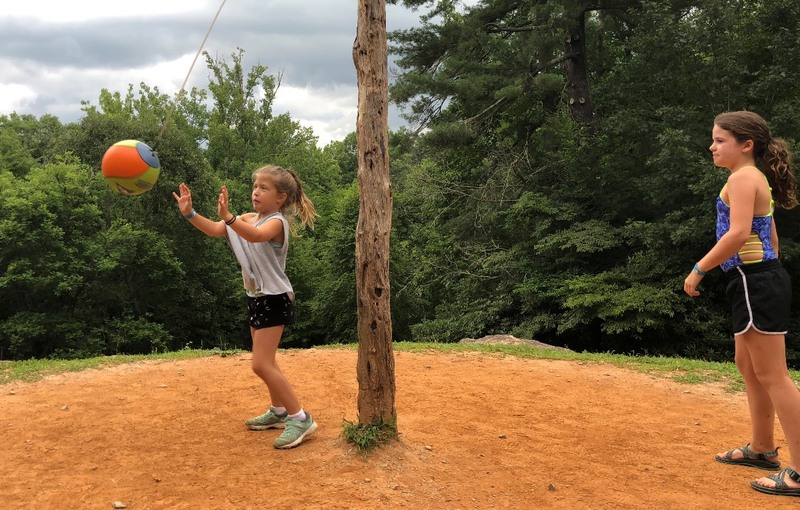 This may all sound like serious stuff, and to an extent it is for some of the girls, but playing tetherball is also a fun game of skill perfect for playing with friends at camp. 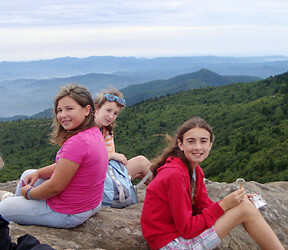 Today the adventure staff announced a trip for the girls up to the Blue Ridge Parkway and a hike that included a stop at Devil’s Courthouse. This is a spectacular destination. At an elevation of more that 5700 feet, it has a panoramic view of the surrounding mountains. On a clear day, you can see 4 different states! 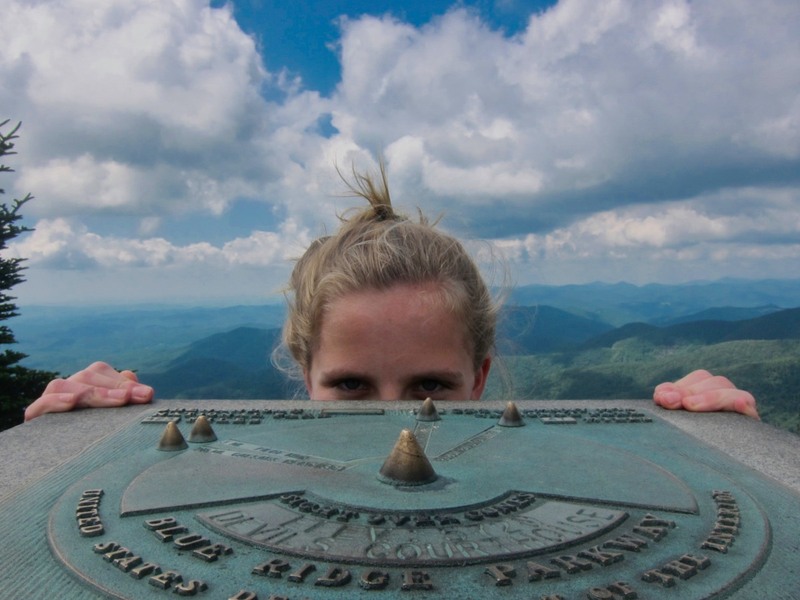 This photo shows a girl crouching behind the marker that allows you to identify far off mountain peaks by sighting over the brass cones. It’s quite a steep hike to reach the summit, but this view is really incredible and definitely worth the trip when the weather is nice like it was today. 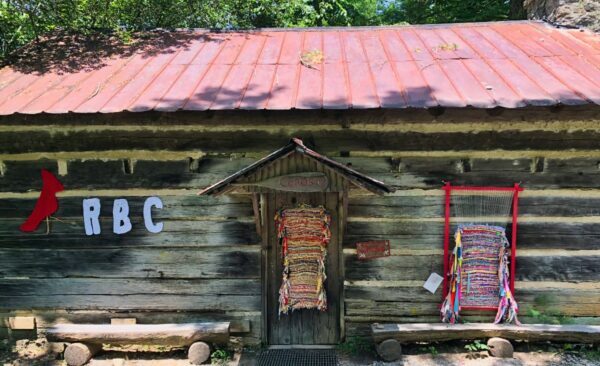 This afternoon, we paused our regular activities for “cabin day,” a time when each cabin sticks together and enjoys a special activity as a group. 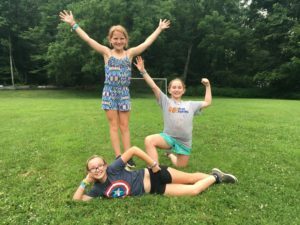 Ordinarily the girls sign up for individual activity schedules, so this is a nice time to bond with bunk mates and do something special. 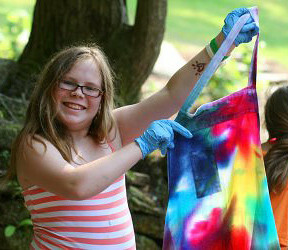 One group decorated t-shirts with markers, while another used paints to design colorful glass jars. There was food involved for some— decorating cupcakes for the kitchen, using a scoop to make a huge bowl of watermelon balls, or shaping cookie dough for baking the evening’s cookies. Another group played games like an egg toss, and another took a hike to Rockbrook Falls for a wet-n-wild creek hike. All of the Senior girls stuck together for a picnic dinner in the Pisgah Forest followed by a trip to Sliding Rock. This trip has become a tradition of sorts at camp because it’s so popular. 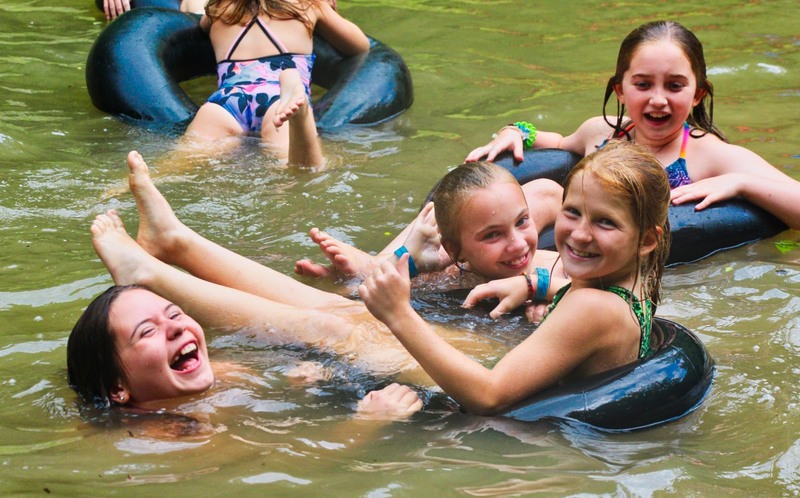 The girls love loading the buses and riding high up into the forest to eat dinner and play a few games before screaming their heads off while sliding down the chilly natural water slide. 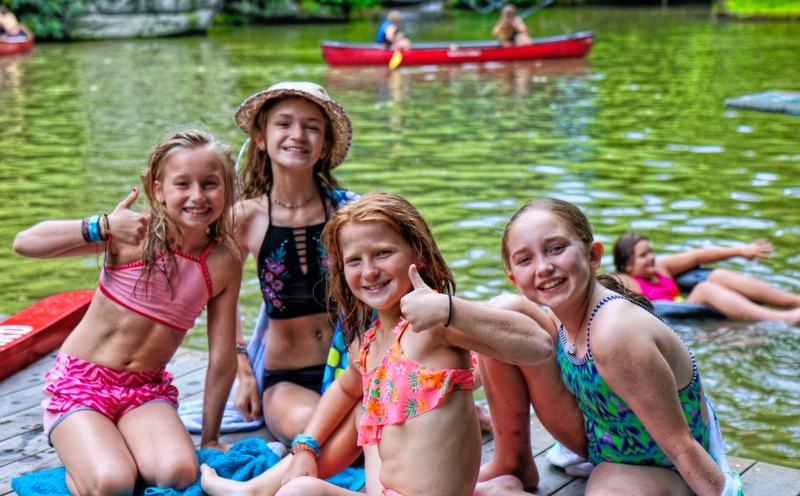 One glance at the photo gallery and you can tell by the looks on the girls’ faces— an extraordinary combination of wide-eyed trepidation and full-bodied excitement —that sliding rock is a true thrill. It was impressive how many girls slid down the rock multiple times, each time getting just a little colder and even more excited for the ride. The end of night brought all of us (almost 100 people in all) to Dolly’s Dairy Bar, the one and only ice cream stand. This too is a loved tradition, a must-do part and the perfect cap to this thrilling night out. 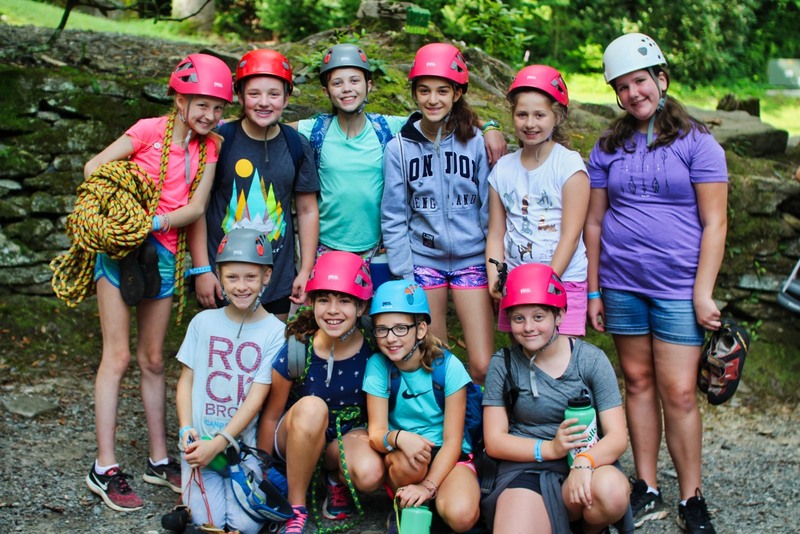 There’s a comment I hear fairly often, I’d say several times a year— “I wish Rockbrook had a summer camp for adults.” Sometimes moms, and more rarely dads, look fondly on the camp experience their daughters are having, and can imagine themselves enjoying it too. It’s remarkable that this adult desire to experience camp can arise simply by witnessing camp life from afar. 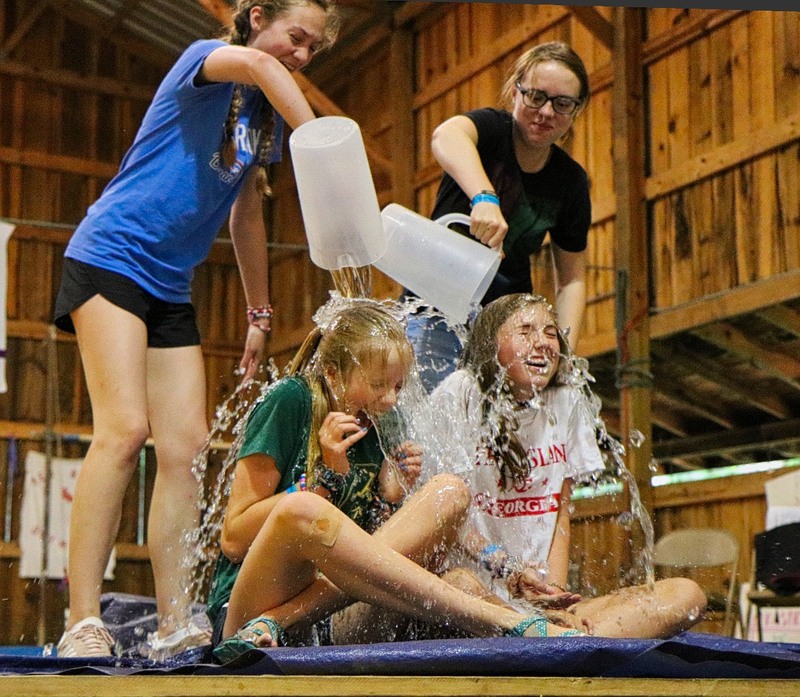 The photo gallery, occasional highlights videos, our social media posts, and this blog all paint an attractive picture, one that proves camp is great for the girls themselves, but also somehow is evocative for adults too. So how about it mom and dad? Do you want to go to camp? On one level, I suspect most adults would say no. No thanks! 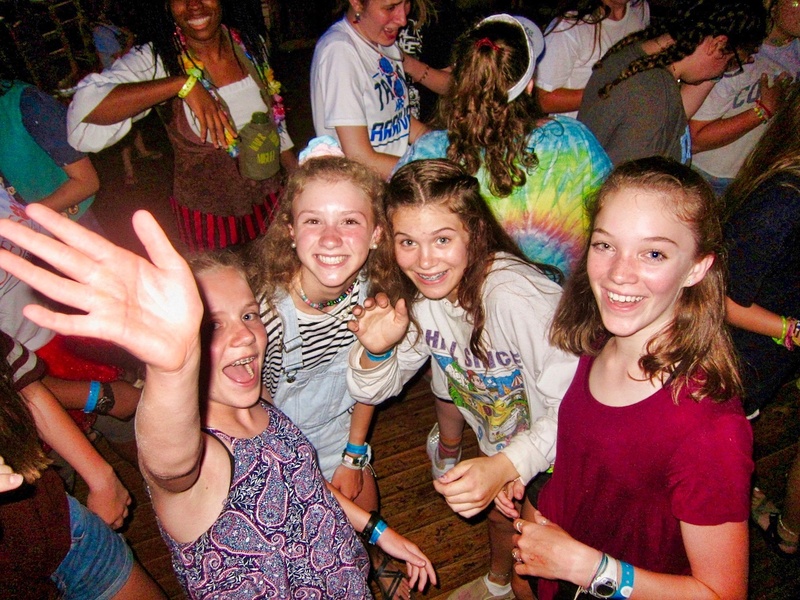 Living at camp is too difficult and requires too many compromises we grown ups have come to happily avoid. Sleeping in a room with nine or more people, having the weather as a constant personal companion, relinquishing all technology (no smart phones, television, or news updates! ), accepting limited food options, and being physically active most of the day, all sound like “roughing it,” and would most likely be unpleasant for the average adult. 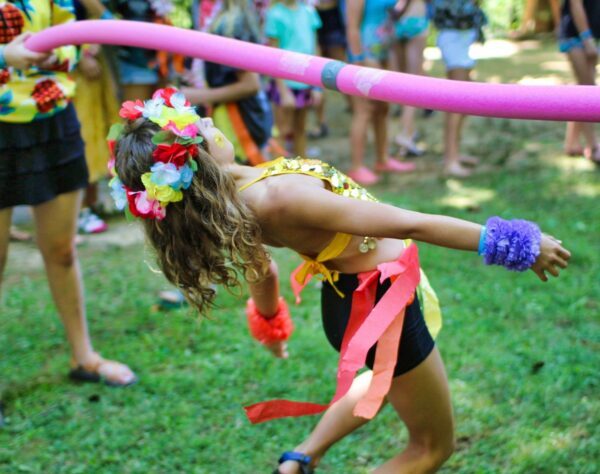 In these ways and others, camp is fun for kids, but most adults won’t get a kick out of bug juice, so to speak. 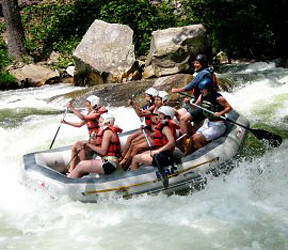 Perhaps the activities are what make some adults yearn for camp. 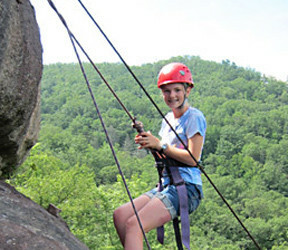 They too want to shoot an arrow and a real gun, climb the high ropes course tower and a real rock, swim in the chilly lake and fly high in the trees on the zipline course. 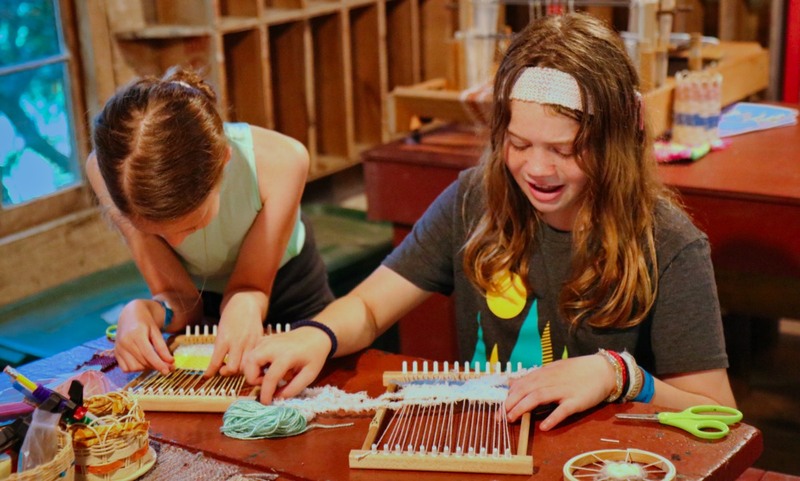 Many of the activities at Rockbrook look intrinsically rewarding— throwing a pot on the potter’s wheel, finding a weaving rhythm on one of the vintage floor looms, tying and dying a t-shirt, for example. 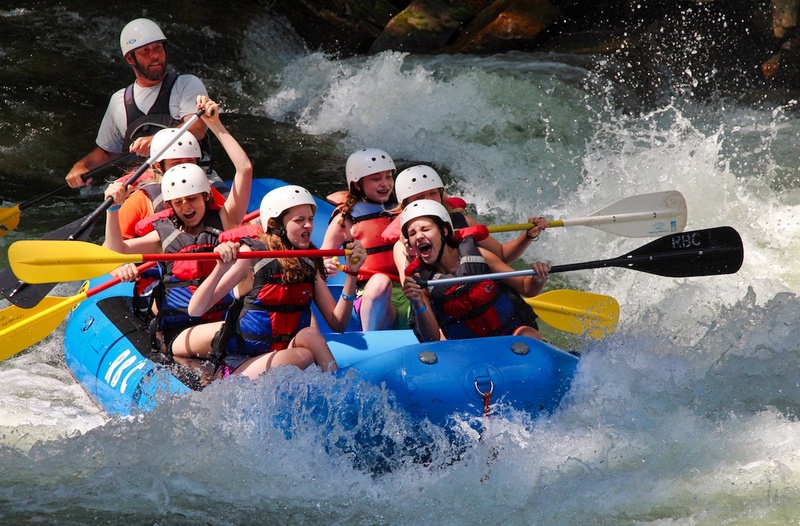 What a nice change it would be from our mundane 9-5, to raft the Nantahala River, backpack and camp in the Pisgah Forest, or simply enjoy the mountain view high up on Castle Rock. 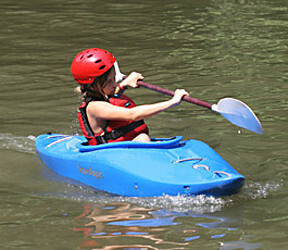 For some adults, camp looks enjoyable because they could try all these activities that are ordinarily difficult to experience otherwise. That seems too simple though, too much like an amusing holiday. 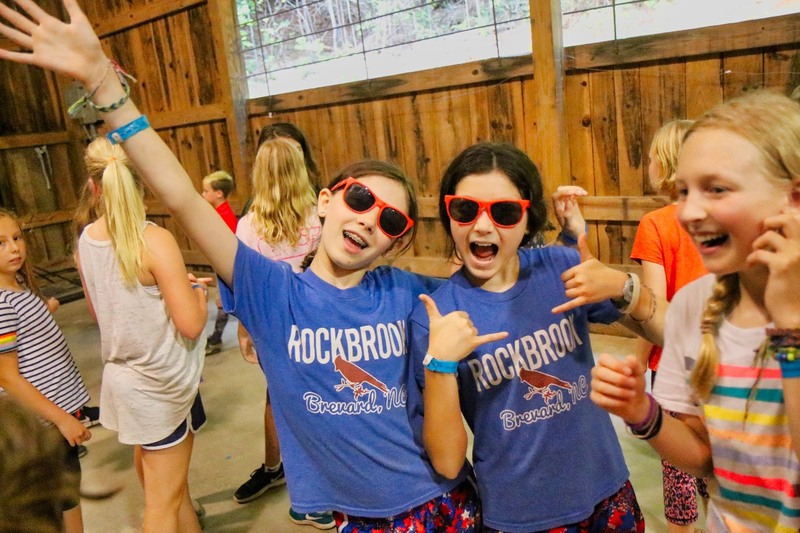 Rockbrook parents know that camp isn’t just entertainment. 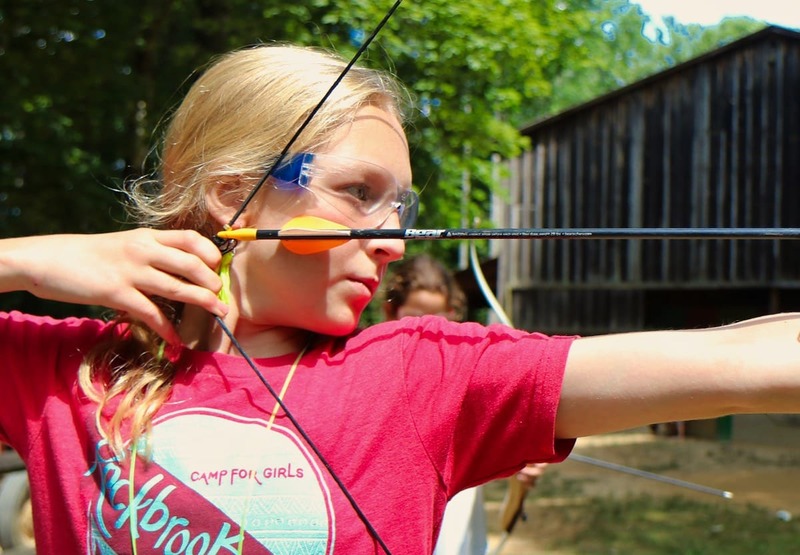 In fact, some of what we do here isn’t fun at all, and yet the girls will tell you they love camp despite the chores, the bugs, and the challenges of being away from the comforts of home. As we’ve said before, campers embrace the difficult aspects of camp life because they are strengthened by the positive community culture of Rockbrook. Being included in a community of kind, caring and generous people helps ignite confidence and nurture resilience in everyone. The scary stuff just gets easier when you are so constantly and genuinely supported for who you really are. 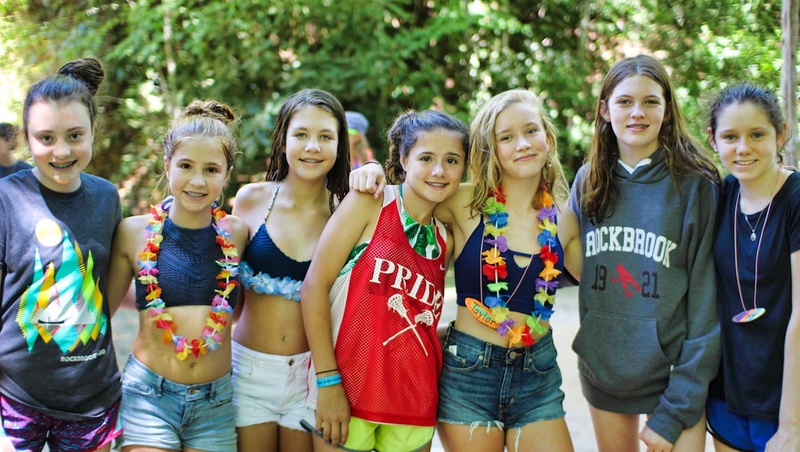 Again, I believe it’s the special community here that explains why the girls at Rockbrook tend to feel so happy and relaxed throughout the day, breezily chatting and comfortably enjoying each other’s company. 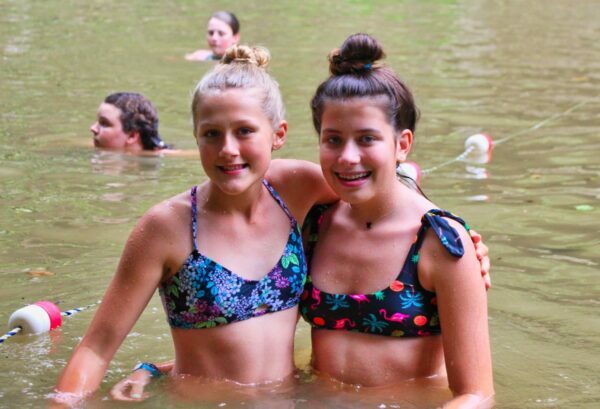 That’s why they make their best friends at camp. When you start with a collective spirit of positivity, and include regular moments of silliness and celebration, almost every day becomes a chance to laugh together, sing together, and grow closer no matter what the activities. There’s a certain presence that springs from all of this throughout the day. 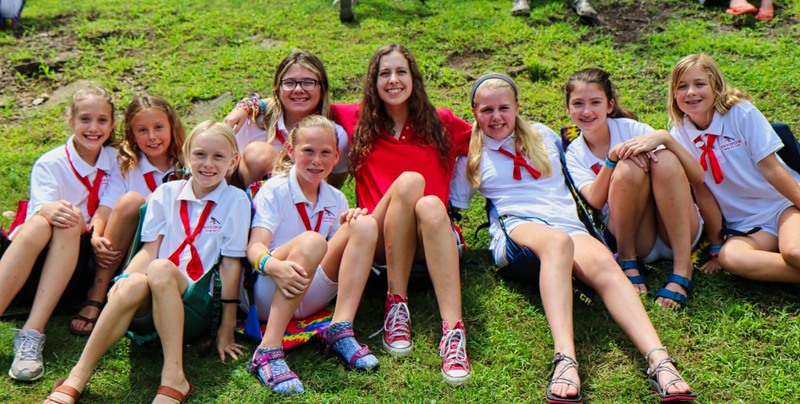 Life at camp feels somehow more real and more meaningful, rich with opportunities. 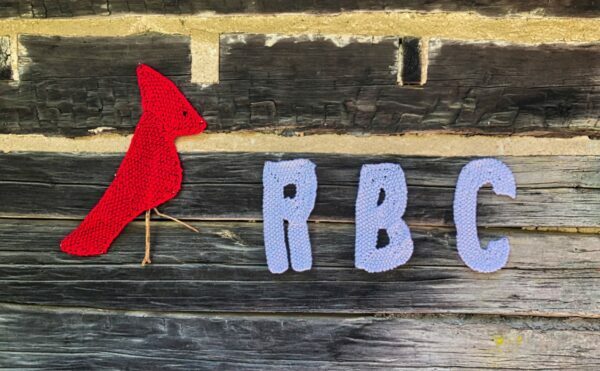 At Rockbrook, we spend our days in ways that are simply very, very good. In some ways then, we adults long for camp days because we recognize their inherent good. 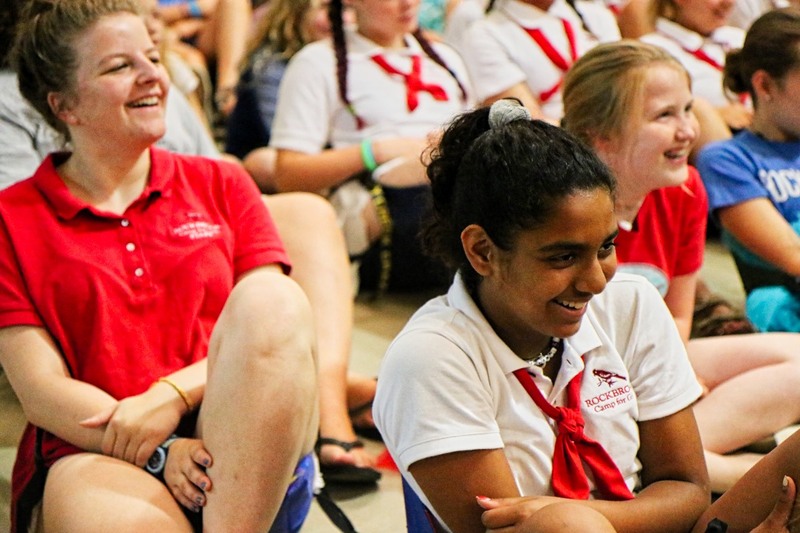 As the routine working world demands we maximize productivity and efficiency, camp represents a place where we can put our relationships with people first, a cultural haven defined by values that foster wonderful details and beautiful surprises. 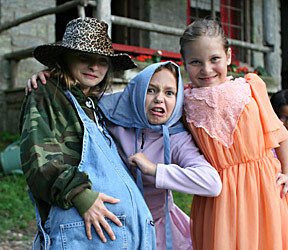 Just as it is for our children, we’d like to experience these same sorts of camp days. After all, we know there’s a life well-lived to be found among camp days. A camp like this… for adults… that would be nice. 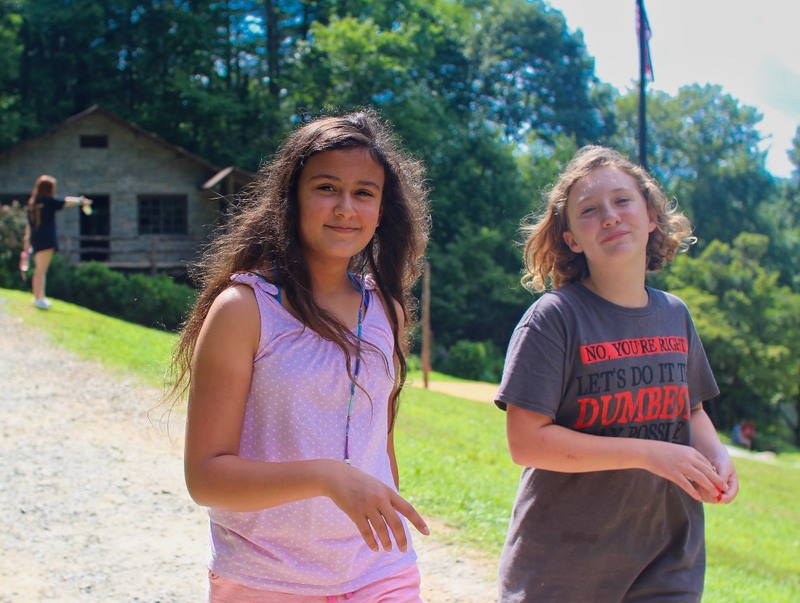 Camp is often thought of as an antidote to many of the things we miss in today’s society: it provides a slower pace, a place to have real conversations, a time to disconnect from technology and reconnect with people. Even reconnecting with people is unique. With more socializing done online and inside and less within the community, many of us only have strong relationships with people who are within the same age, or are family. At camp, however, we are constantly interacting with people, and building community with, people who are older and younger than us. These inter-age conversations give us so many advantages: we are able to see new perspectives and hear new stories, see how far we’ve grown or where we are growing to, and form a dynamic community where all ages can appreciate what the others are offering. These relationships are woven into the fabric of camp. At dance today, for example, there were three juniors and two counselors dancing. The counselors were patient and kind as the campers picked up the moves, each representing their own unique personalities in their renditions. Then, when they took a break, I thought about how naturally the girls and counselors were talking. It was simple: they were talking about movies (the song “Thriller” was playing, which some of the girls recognized from Thirteen Going On Thirty), speculating about the upcoming banquet (a topic that is endlessly interesting), and about the upcoming dance show. Even though the conversations were simple, they were quietly profound; each girl was known, and was able to share her unique experiences with the group. There aren’t many other times that twenty-year-olds and eight-year-olds sit in the same room and talk about their lives and experiences. This happens all the time, all throughout camp. It’s there when girls are sitting on the dock talking to swimming instructors after swimming in the lake. 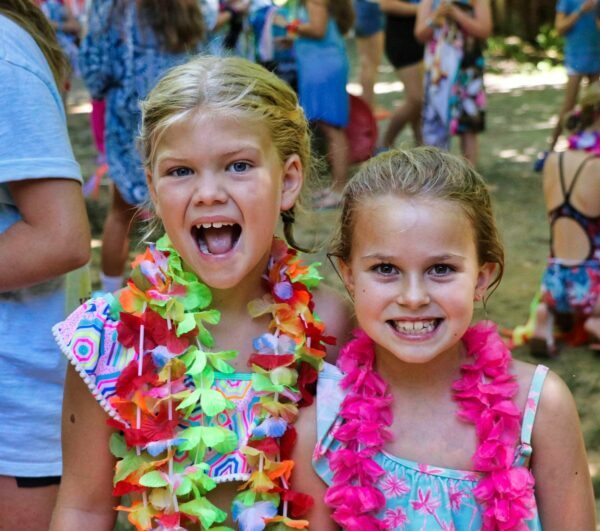 It’s there when seniors led the Luau on Sunday, welcoming new campers and inspiring their excitement about the activities. Maybe it’s best represented by the Hi-Ups, who have the most structured interactions with younger campers. 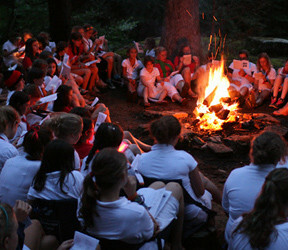 Yesterday, I helped lead the junior overnight at the Rockbrook outpost, a ten-minute walk from camp. A few Hi-Ups (the oldest campers) were helping me build a fire. One of the Hi-Ups said she had not been out there since she was a junior. When the juniors came to meet us out there, she knew all of their names, and knew what to do to make the overnight incredible. Knowing her was clearly meaningful for the juniors; they all asked her to sit beside her, and the way she knew them made each of them feel special and valued. By getting to interact with people older than them, juniors are able to see role models of who they want to be as they are growing. Yet it was also meaningful for the Hi-Up. At the overnight, she was able to see how much she had grown in her years at camp, to help provide an experience for others that had meant so much to her as a junior, and to enjoy the new perspectives and sense of joy that come from talking to an outgoing and spirited cabin of juniors. Counselors have told me they love talking to campers partly because of the way campers ask them to see the world. One counselor laughed as she was telling me about her cabin of juniors who told her they were missing Bobby. She did not want to seem so out of the loop that she did not know who (or what) Bobby was, so she asked a lot of questions about what he looked like. What does Bobby wear? A top hat and a rainbow striped outfit. Could he have wandered off? No, he has no legs and arms, but he could have rolled. What color is Bobby? Rainbow (we just told you that!). It turned out Bobby was a cork the group had decorated. The counselor dove head-first into their mission, and the cabin even made an announcement at a meal about how he had gone missing. In the end, it turned out that he was found in a Crazy Creek, not far from where he was last seen. As I type this, rest assured that Bobby is safe in his box, a nice place, similar to where you may find a charm bracelet, with a nice foam mattress and a construction paper blanket. On the lid, you’ll see “Home Sweet Home,” written in Sharpie. As we grow up, and are inundated by pressures and distractions, it’s rare that we get the opportunity to work together to find a cork in a big camp, and we remember how much pure fun the simple parts of life can be. 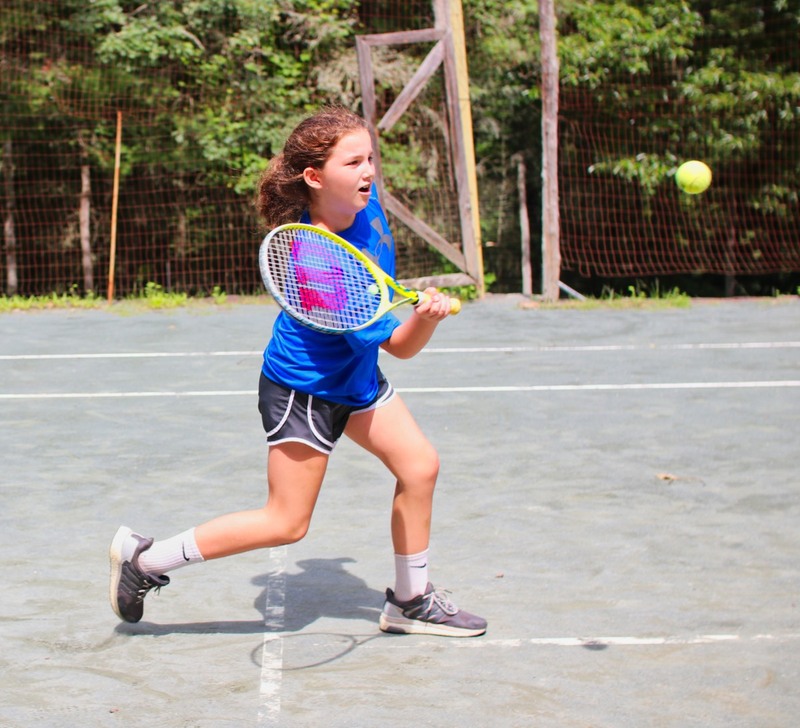 In addition to these inter-age conversations that happen between campers and each other, and their young counselors, this extends to an even greater range of people. A great example is Kathy Singer, who was a Rockbrook Camper from 1956-1957, and then came back as a counselor in the 60s. Now, she teaches the Folklore Activity, and she is beloved at camp for her stories about camp and also her stories about life. 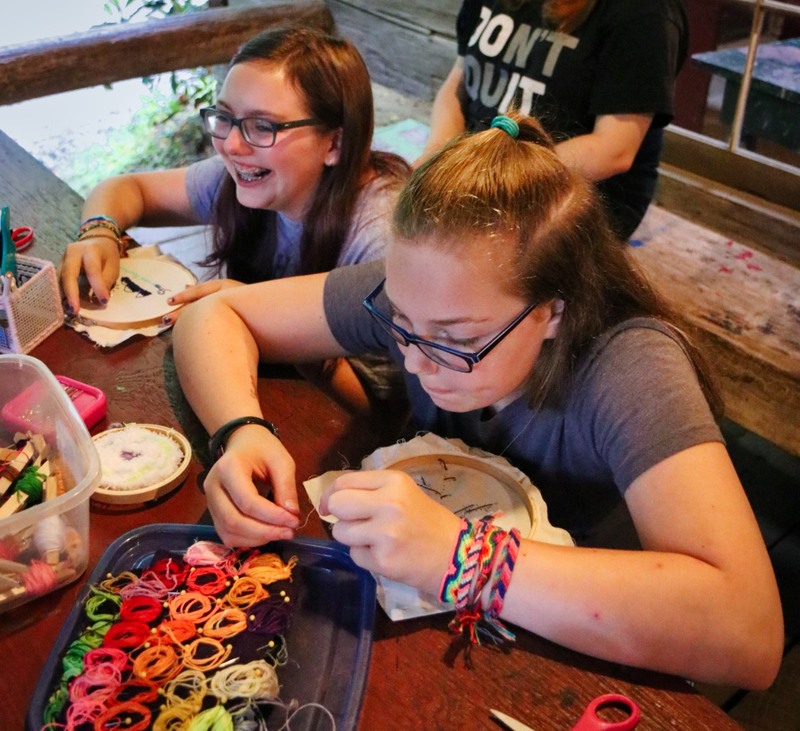 Recently, campers and counselors started the “Kathy Singer Fan Club,” complete with stickers, a testament to how much she has meant to the camp community this summer. 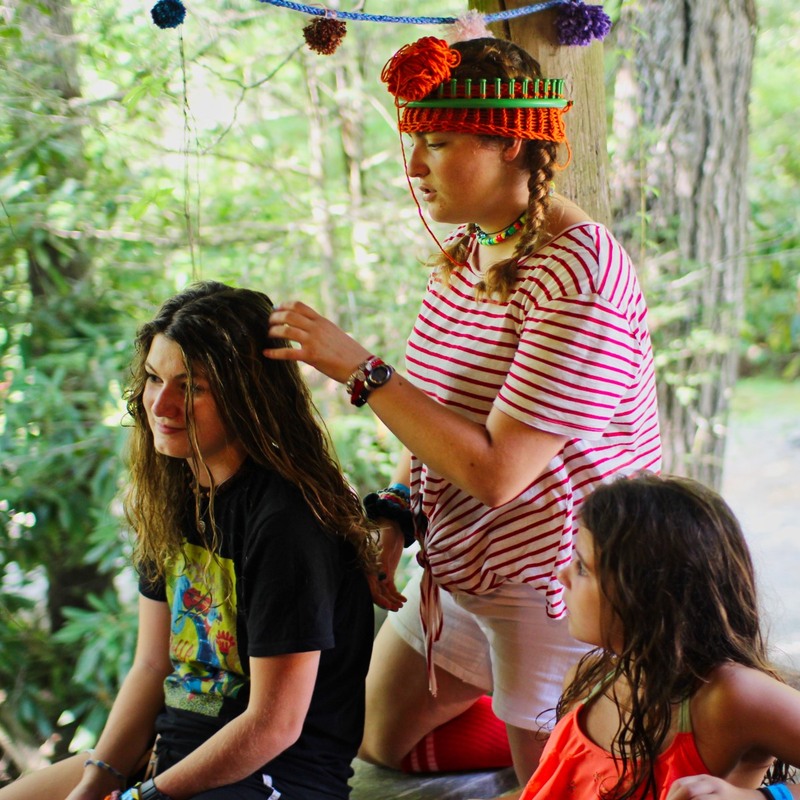 By continuing to have these inter-age conversations, we are keeping the traditions of camp alive; we are all a part of this larger community, and we take care of each other, knowing that this spirit will continue into the future. We also learn more about other people, the change in times, and how much we have grown. In a world where we are sometimes disconnected from other ages and perspectives, how lucky we are to come to camp and grow together. A creative mistake isn’t your conventional mistake. It isn’t a roadblock. It’s not a signal to rip up your project, throw it in the trash, and start all over again. It is a mistake that can lead to a new way of doing something and, as a result, lead to a more interesting finished project. It may feel disruptive in the moment, but when embraced, it is a thing of creative beauty. A day doesn’t go by that I don’t hear campers nervously proclaiming, “I made a mistake!” as they drop their project onto the table in defeat. I very quickly tell them there is no such thing as a mistake in Curosty, and encourage them to keep going with their project. Bumps of yarn sticking up from a woven bookmark makes for a cool texture. Running out of time to weave a rug turns into a little mat for your cat. Just recently, I had a camper who was working on a circle weaving make the decision to veer from weaving in the circle shape because she wanted to cover up the blue yarn she no longer liked. Her finished weaving had dashes of yarn across the center making for a really neat design with unexpected pops of color. 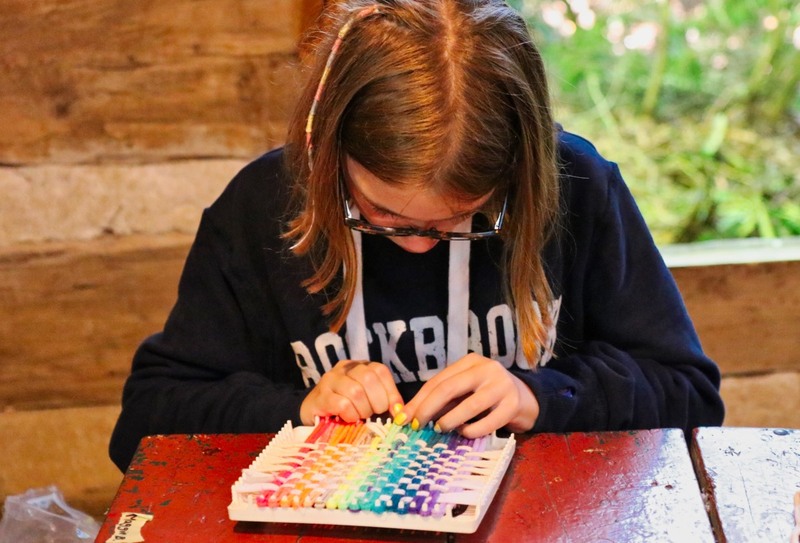 At school or at work we are not always given the space to make mistakes, but here at camp it is welcomed as a tool for learning and discovery. There is value in making mistakes in a creative endeavor because it can turn into something uniquely you.